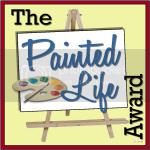 I Received the Painted Life Blog Award! I just saw on one of my comments that I recieved another blog award. I’m soooo honored!!!! I can”t believe the amazing group of bloggers out there, and I am part of them! Wow is all I can say. And thank you!!!!! This award is even more meaningful because I am one of the first recipients of it! The award was given to me by The Painter Mommy and it’s the first blog award she’s created! Below is what this award is all about! This blog award is dedicated to those who live a colorful and creative life through the writings of their blogs. Just like each careful stroke of an artist painting a masterpiece, they write and share from the heart – life, advice, tips, reviews, information and anything else that adds life and color to their blog. 2. List some ways that you show your colors and creativity on your blog. Are you “real”? Do you speak from the heart? Do you have a passion for anything in particular? 3. Link back to the Painter Mommy’s post and this post & then add your post URL on Mr. Linky at Painter Mommy’s site. Painter Mommy said she gave me the award because I speak from my heart. Awe. So true. I do tend to spill out speak whatever is on my heart. So, now to pass on the award! Woo hoo! These are all blogs that I haven’t awarded yet. Please don’t be offended if I didn’t choose yours. I really wanted to stick with blogs I haven’t awarded yet. Not that others don’t deserve it, because for sure they do, but I thought I’d give someone else a chance to award them too. Does that make sense? I hope so. I Received My First Blog Award!!! Take the Life Empowerment Challenge! Congratulations!!! I always enjoy visiting your blog. I just met you and can understand why you have been awarded with this wonderful award. Congrats again! What a great honor! Your blog is great and I’ll be checking it out in the future.